To have snow on my face right now. To see it on my shoulders, my arms. To see each footprint of every creature, every breath of wind. To hear the silence of the snowfall. To smell its cool, damp freshness. To feel it give way underfoot, to hear its crunch. To see it pick out every branch, define it, enhance it, perhaps even burden it, until it is shaken off, or brushed off, or pushed off by sun or wind or rain or more snow, or a passing critter. To see it soften a landscape, draw a new one. To hear it slide off the roof, hit the ground with a resounding thud. To wake in the middle of the night and it is so quiet you can hear it in its silence, you can hear the snow falling even as it makes no sound, the snow, drifting down in a world so soft and cold it is hard to imagine yet there you huddle snug and warm in the middle of it. 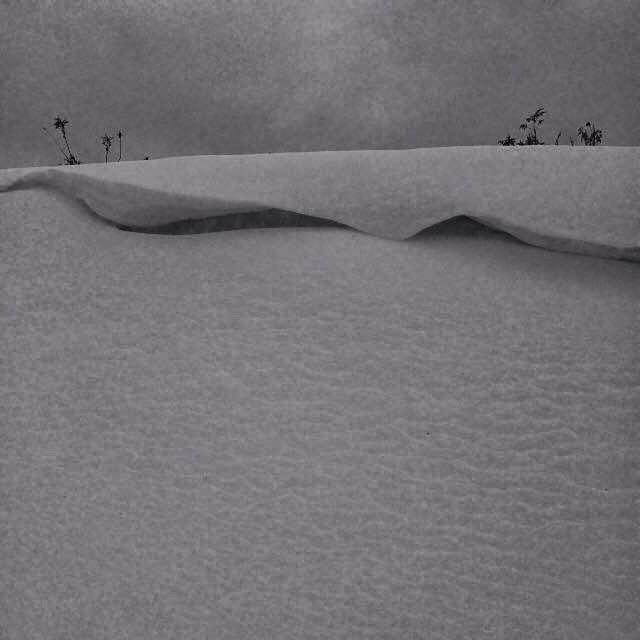 To fall back into a bank of snow, feel it catch you, give slightly, hold you, hold your impression. To scoop up a handful, form it into a ball, throw it. Try to hit that tree over there. Miss wildly. To shovel a path for yourself and your dog and to watch your cat disappear as he steps gingerly around that bank of snow. To see moonlight reflected on fields of snow. To stand still, to let it swirl around you. To feel each flake, soft as a breathe, as it lands on your cheek. To go out on a clear, still morning after a storm to see what nature has done. To see the swirls and dips and folds and flat planes and impressions and layers and improbable obstacles and to know it has nothing to do with you, cares nothing for you, but is a gift, nonetheless, sometimes of dubious origin, to be sure, for who would give such a gift? A gift of beauty but hardship. To listen to the intense quiet until a tree pops in the cold. To catch in the corner of your eye a swirl of snow leaping from the crest of a drift, dancing ever higher, ever higher through the air. I walk and feel the warmth of sun on my shoulders. On my face a breeze of ocean air, light, fresh, damp, alluring. The ocean swells and crests and breaks and curls and rolls and climbs the shore and recedes, over and over, always in motion, always movement, the waves sometimes orderly, arriving with pattern, cresting and rippling shut like a clunky zipper north to south, each wave, time after time, and sometimes the waves are disorderly, zippers opening and closing every which way then clashing, smacking together, shooting up water like geysers, like dancers in a mosh pit, and sometimes a wave is rolling out, down the slight slope of the shore, back to the ocean, and it meets a wave rolling in and there is confusion. The water roils. The water moves. Constantly. Pulled and shaped by wind and tides and, for me, the unknown. The roar and rumble, the seethe and the lull, constant. The light on a clear blue day is harsh. The sun spills light and the ocean shoots back sparks. All is blue with glares of pale gold and yellow. The light with clouds, with a haze of fog, is fantastic. All colors arise from the ocean to rest on its surface, seemingly grey, but more a mosaic of blues and oranges and pinks and reds and purples and lilac and greys and every color. Like the sky. The grey sky full of light and color. Some days the wind blows hard across the tops of the waves releasing tall, curling plumes of spray. As the plumes reach ever higher the wave becomes twice its size and the air becomes ever fresher, ever more exhilarating. It is like watching the flame of a fire. I walk and my footprints join others, bare feet tiny and large, patterned shoeprints, the paws of dogs, all rounded, circles within circles, crossing and criss-crossing precise, twiggy trails of shorebirds. And the ocean leaves its mark along the shore with rivulets and streams that trail like seaweed and tiny pools that gather and encircle pebbles and shells. I walk along, the ocean laps at my feet. One day I asked my mother what she wanted for Christmas. “Peace and quiet,” she said. 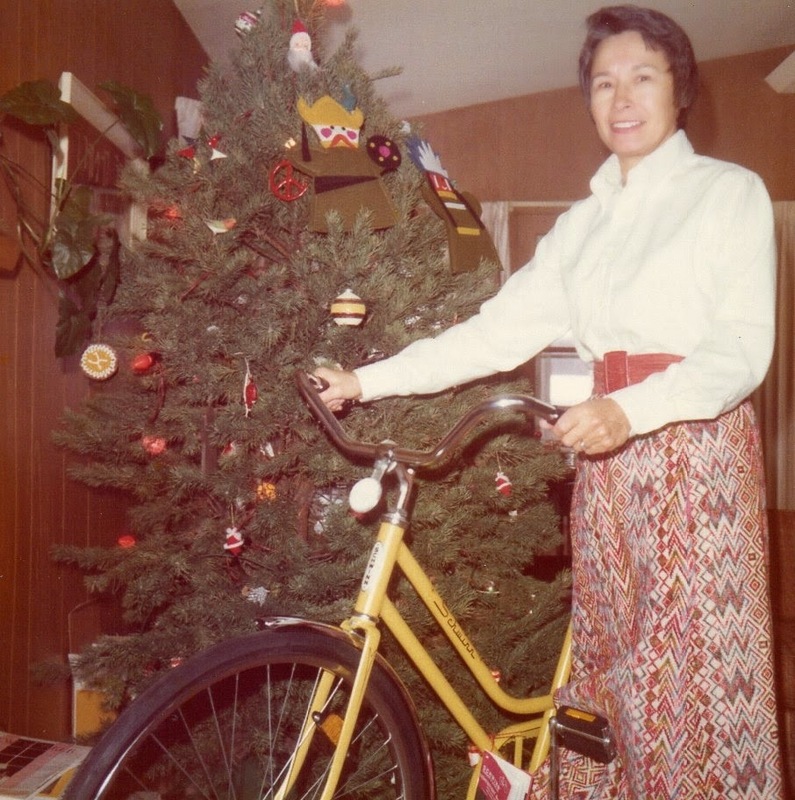 One year she got a bike for Christmas. Another day I mentioned that Christmas was right around the corner. “What are your memories?” I asked. I’ll Be Home For Christmas played softly in the background. Diana Krall sounded all wistful and jazzy. My sister, or maybe it was her husband, found a box of old Christmas stuff in their shed. Oddball items such as a red and gold skirt for a tree and a couple of black steel candleholders, one like a lantern and one in a spiral, resembling a tree, both adorned with plastic greenery and little red and gold balls and such. There is a group of small, wooden, Disney-like creatures made in Japan with wire springs for necks so their heads bounce and jive. Some hold an instrument and their paint is peeling. One—it looks like Goofy or maybe Pluto—is missing an ear and yes, I do believe a dog ate that. 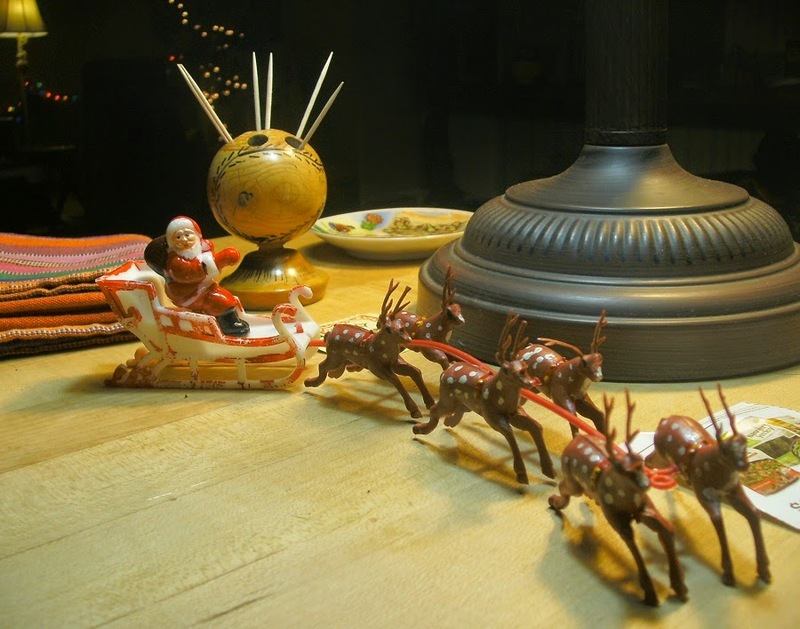 Some waxy red candles are slightly bent and misshapen, and there’s a plastic Santa in a sleigh pulled by six plastic reindeer. Remnants of Christmas past, the Christmas we grew up with, now jumbled and stored in odd and various plastic bags in an old cardboard box in this shed in California. Except for having lost their tattered tissue paper wrappings, these ornaments, these trinkets, and this floppy cardboard box—well, not so very different from last century. 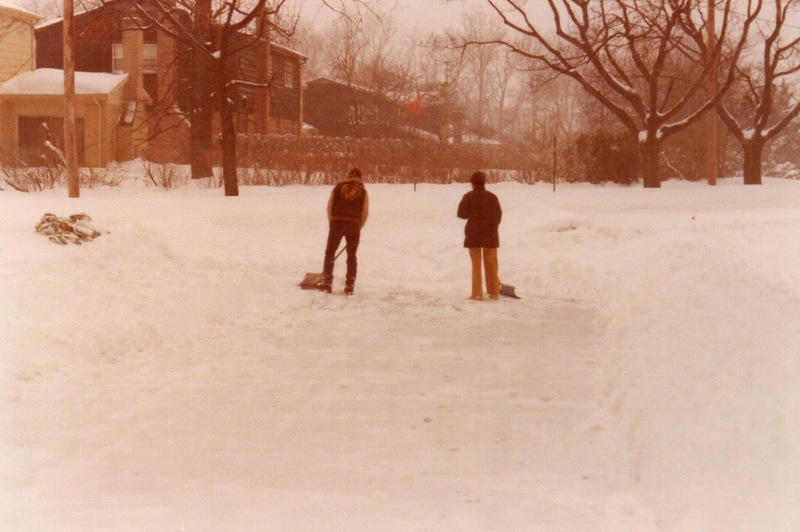 In 1978, we shoveled snow for Christmas. This is, of course, a season and a holiday when too much is made of so much of everything. Too much is made of family and harmony and togetherness and peace and snow and a warm hearth; popcorn, snowmen, gifts, gifts, gifts and giving and good will and feasts and chocolate and cookies and lights and parties and parties and good friends; good cheer, fake snow, snow, puppies in Santa hats. Merry merry and joyous and happy, and happy, and happy. Unless you are unhappy. Where’s the mistletoe? And sweet black licorice? Where’s the sweet black licorice? Have some! It can feel, all at once, like a sham and a burden and it can feel, all at once, like a truth and a blessing. Who needs eight reindeer when six will do? Open your heart, loosen your reins, sing a song, consider the glory. Bells are ringing. 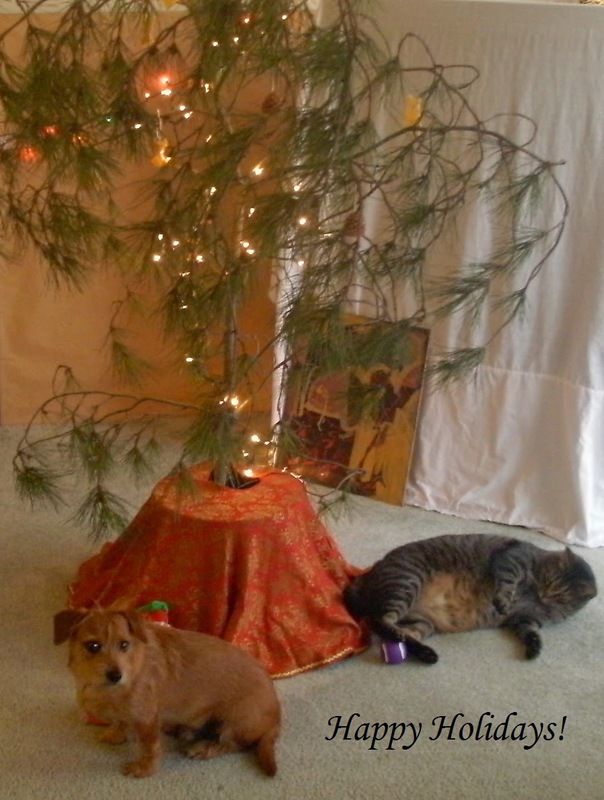 Throw in a manger, a wise man, a dreidel, a menorah, a “Silent Night” and give a nod to Kwanzaa. Behold the winter solstice. (Hallelujah.) Here comes Santa, and here comes baby Jesus. Travel, stay home, drink too much or drink too little. Follow a star. Watch movies, sleep late, get up early. Listen to music, go to church, dance, crack nuts. Ponder. What it means. Stop and ponder what it means. Josie and I went to the beach. We delivered packages to the post office then stopped at a beach we stop at just once in a while, but someday I will write about this beach because there is a beautiful mosaic as you enter the parking lot and later as you walk you encounter an interesting statue of a mermaid. The beach is a cove protected by various breakwaters and at first you walk along heading south and then curve and head west. The beach is clean—less flotsam and jetsam rolling in perhaps because of the breakwaters. The waves roll gentle and long and curving and a few people walk along, and dogs, and birds. This is a cool day in the low 60s with broad stretches of clouds and a gentle breeze. After our walk we head back to the van passing a plank bridge that leads to a plank walk that is a pier. Josie runs down it, turns left, turns right, no one is on the pier, he investigates, a fish jumps. A gull stands guard atop a pylon keeping a close eye. I think of the men I have loved and realize I still love them, each and every one. They are not many, mind you, hardly a handful, but why think of it? I wonder. Maybe it’s like when a new version of an old song gets stuck in your head. I call Josie. He runs over, hops in the van, we head home. With love from Josie, Elliott, and me. A friend led me to a New York Times article about the Pope saying something about all dogs going to heaven. At first I thought this was some sort of made-up smash-up between high-falutin’ journalism, holier-than-thou religion, and Hollywood, but then I clicked through and found it was for real. You may have heard about it. 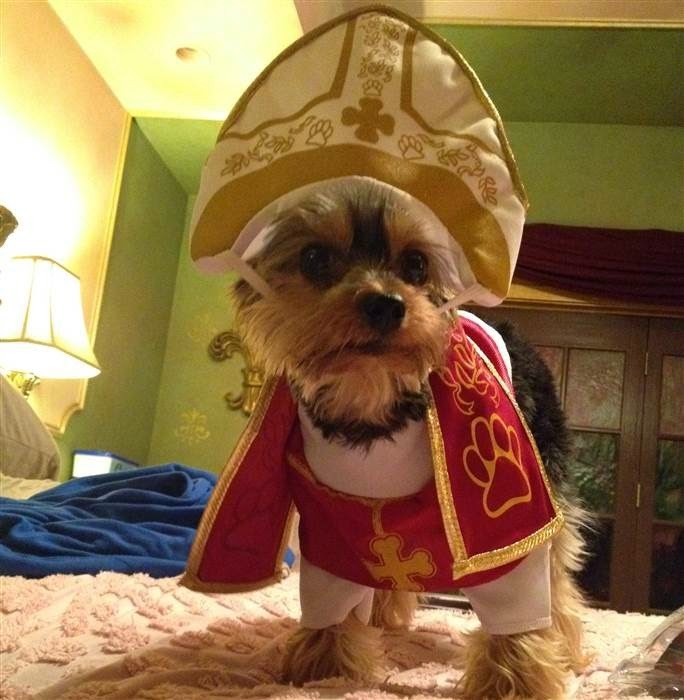 There’s nothing quite so good as a good dog-and-Pope story. Now, if you look at the current version of the Times article, you will wonder what the heck I am talking about because that part about getting along in heaven has been deleted. I am glad I captured it before the Times got the story straight, because it’s the part that made me think about two pets of mine, Goldie and Queenie, who never got along. Perhaps now that they are in heaven, the story is different. Goldie is a cat; Queenie is a dog. Which reminds me of a Smothers Brothers song. 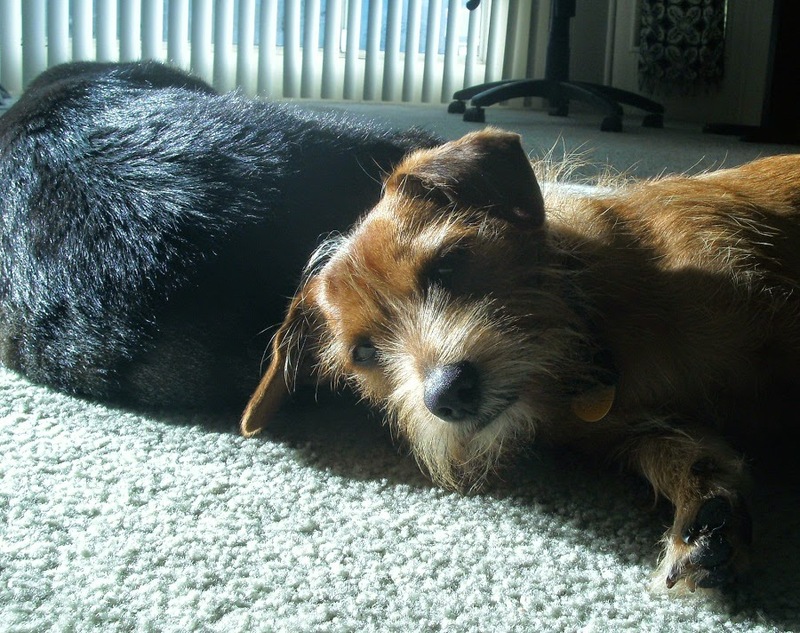 A bit later that day the sun shone through the slats in the blinds in the living room leaving long bars of sunlight on the rug. Elliott was stretched out, soaking up as much light and warmth as possible. I forget why I came into the room, but Josie followed me, and when I sat on the floor to pet Elliott, Josie sat too and soon he was splayed out, flat on his belly, legs stretched fore and aft. As I stroked Elliott he rolled over, and so then did Josie roll over, too, onto his back, stretching his back legs farther, farther, toward Elliott, who now stretched forward with his front legs, batting lightly with his paws at Josie’s ever-waggin’ tail, as if trying to catch it, and then grabbing playfully at Josie’s back paws. Elliott and Josie on another day. 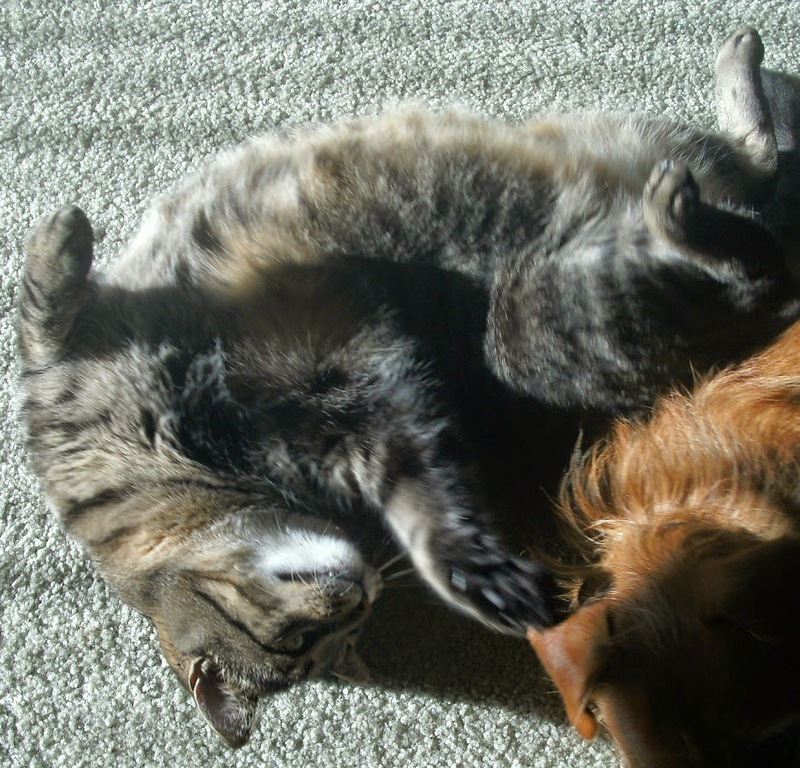 These two are getting along fine, and it occurred to me that maybe it is all this sunshine. Maybe they think this is heaven. Josie’s mouth is too small to fit around a regular-size tennis ball, so a while back I bought him the smaller tennis balls made just for little dogs. Now Elliott plays with these balls, too. Josie shares, seems to shrug his little shoulders as if to say okay, Elliott, now you play with this ball, I’ve got old Chippie over here to worry about and chase and chew on … And Elliott bats the ball around then falls on his side, grabs it with his front paws, pummels it with his back paws. Sometimes Elliott will watch as Josie chases the ball, grabs it in his mouth, makes a joyous leap, runs back to me with the ball held high, and we do it all over again until suddenly Elliott dashes across the room in front of Josie and Josie skitters and changes course, chasing Elliott, and sometimes it ends abruptly and Josie comes running back to me with the ball and sometimes it accelerates and there is mad dashing all around the house, the ball forgotten. When I sit, Josie sits next to me, and from the start, from way back in June when Josie arrived, this put Elliott off—he no longer sat with me, not with Josie there. Now Elliott is back. 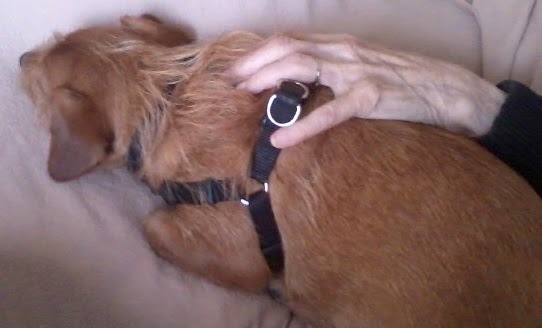 He moves in, Josie may have to re-situate a little, and soon I’m covered with dog and cat fur. Sometimes Elliott ends up half sitting on Josie. Sometimes Josie licks Elliott’s ears. Sometimes Elliott lightly touches Josie’s nose and face. I am not sure I completely trust Elliott in this—I remember his expressions of disgust when Josie showed up, his refusal to play, and I remember long before then how he used to plop down on the floor next to Buster and then Buster, at that point rather blind and deaf and often disoriented, would trip over Elliott and Elliott knew this would happen and he seemed to get a good kick out of it. Now Buster is in heaven. And in the year and then some between Buster and Josie it seemed to me that Elliott was happy to be the only one, to be the only pet, and I told everyone that, but now, stretched out on the floor in bars of sunlight right next to Josie, it seems to me that Elliott is quite happy to be one of two. Loud booms alerted us to the start of the fireworks. Josie flew to the front window, barking. He continued to bark even as we went outside. He barked and barked until the fireworks stopped. 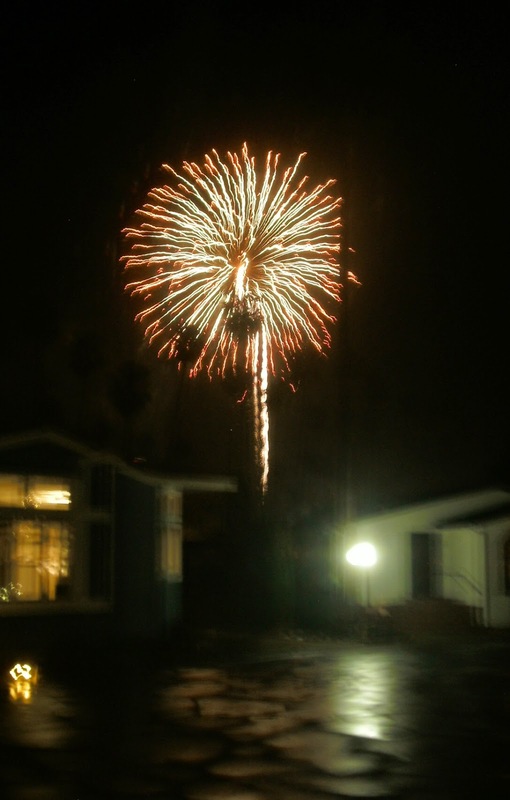 Fireworks through the front window. The harbor is having its Christmas party. During the day we walked through the festivities. I always tell people that Josie is a sissy, kind of a momma’s boy, but maybe I am wrong. Josie was not afraid of the whirling, twirling, blinking carnival rides. He was not afraid of the children, the babes in strollers, the adults, the old folks, or even the chihuahua in the Santa suit. He was not afraid of the carolers in Victorian garb or the fake snow, the soap bubbles flying through the air and the kids chasing them. Later, in the evening, during the parade of boats, when all the boats were lit up and cruising and playing funky music, Josie was not afraid of walking through the crowd of kids and teens and parents and grandparents and little dogs and big dogs all along the sidewalk, along the marina, laughing, playing, drinking, eating, talking; and he was not afraid of the helicopter that flew by with Santa’s red-and-white blinking sleigh right below it. Josie and I walked and walked and got turned around in a dark and quiet boat yard and still he was not afraid. When I first met Josie, he was afraid to leave the shelter and walk with me. That’s how it seemed. And there are still times when he seems afraid of one particular person or another. But maybe it is something else. I mean, how can a little dog who barks at fireworks and who makes a friend of Elliott be thought of as anything but brave? Whether dogs go to heaven or not, well, who knows. I’m just glad that Josie is here with me, right now. Heaven can wait. Well, I’m not sure I can do this. Stop this journal. Make it only about the beeswax. Maybe there should be more beeswax here, now and again, and maybe all this personal stuff just confuses potential customers (not to mention others! ), but not to do this? Not to do what I’m doing right now? I love doing what I’m doing right now. Perhaps this is withdrawal or quitter’s remorse or something. What happened is this: I was searching for a document, my lip balm labels document, to take to a Staples or somewhere to have the labels printed on the full-page label stock I have (then I cut out each little label with scissors because that is the cockamamie way I do things), and I couldn’t find the document, but finally I did, and I was putting it on the little gizmo thing I think is called a zip drive to take to the Staples or wherever, and there’s all sorts of things on this little gizmo drive, and I got curious about “14624,” an image file, no doubt a picture of the cabin I left back in the U.P., and I kept ignoring it, but then finally, opened it. 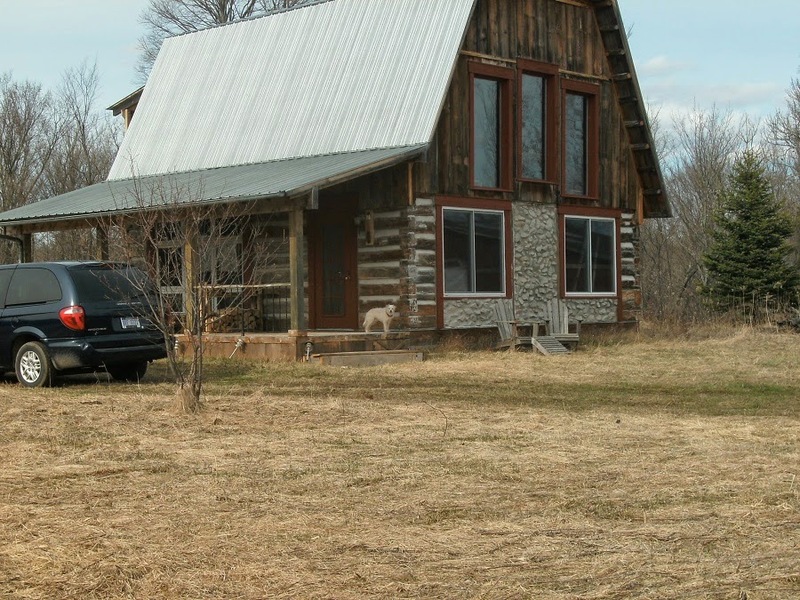 That’s the cabin—my house—soon after I bought it. And there’s Buster on the porch. Later the mail arrived. Every day here I get mail. Five days out of six it’s ads. Then, on the sixth day, who knows. But today it was a Bed Bath & Beyond circular with a huge advertisement for state-shaped cutting boards. Pictured were Texas, California, and Michigan. But wait—that’s only part of Michigan. The lower part. Hullo. Why not chop off the Texas Panhandle? Which part of California shall we delete? Did you know that Michigan consists of two separate peninsulas? One is called the “lower” peninsula and one is called the “upper” peninsula. Each of these peninsulas then has more peninsulas—the Keweenaw, the Leelanau, the Thumb, the Garden—but that’s another story. The peninsula pictured in this ad is the lower. The Upper Peninsula (we like to capitalize it) may contain about 30 per cent of the state’s land, but it only has about 3 per cent of its population, so, occasionally, it is left off maps, including one documented case that involved an elementary school textbook that was being used in, now wait a minute, the Upper Peninsula. Maybe you’re familiar with the U.P., but maybe not. Look at a map. (Go on, I dare you.) The U.P. is that crooked finger hooking off the top of Wisconsin. It doesn’t even touch lower Michigan. (They are connected, however, by a huge, scary bridge.) Now, if I were making a cutting board in the shape of the state of Michigan, I would include the whole state. So the cutting board would come in two parts. Kind of a nice deal when you think about it. What I wouldn’t do is just shrug and say what the heck, that’s too complicated. It’s raining. Really raining. It started raining last night and it has been raining all day. It’s raining, it’s pouring, it’s divine. Lights are on and even the heat is on. I almost didn’t go out—on the radio talk of mudslides and floods and spin-outs and all those things that happen when a place that seldom gets rain suddenly gets rain, a flood of rain, all at once, made me hesitant. But, what, I don’t know rain? 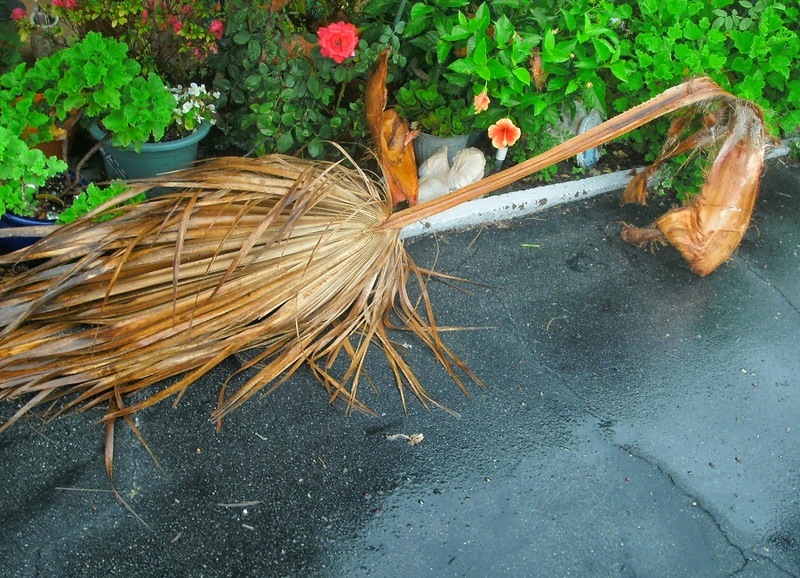 Josie and I went out, drove to the post office, and all we ran into were raindrops and puddles and those huge crazy dried-up palm fronds that fall from the sky. 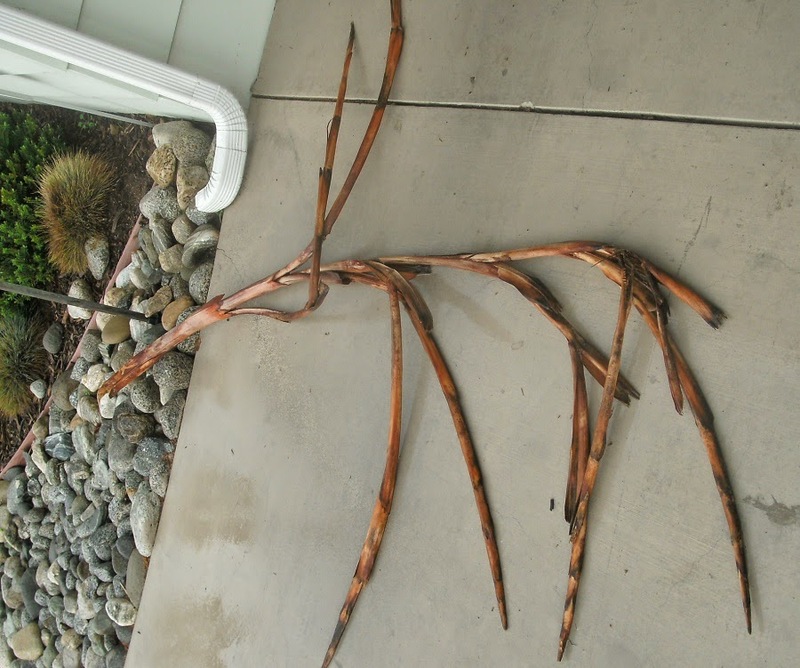 like a crime scene, but now I think it looks like a reindeer. There’s this thing called a barranca behind where I live. It is a concrete gully that leads to the ocean. If it ends at the ocean, I do not know where it starts. If it starts at the ocean, I do not know where it ends. I do know that the water level in the barranca goes up and down with the tides. Sometimes there is no water (low tide); other times there is a few feet or more (high tide). 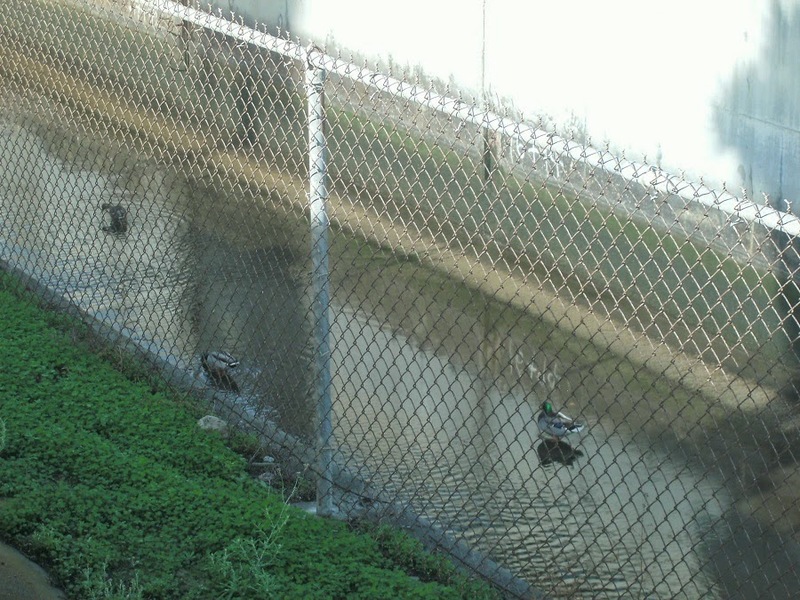 Whatever the tide, there are often ducks in the barranca. This morning there were a number of mallards and these other guys, I’m not sure what they are—do you know? protected by a chain link fence. The mallards were just messing about in the water (I think). 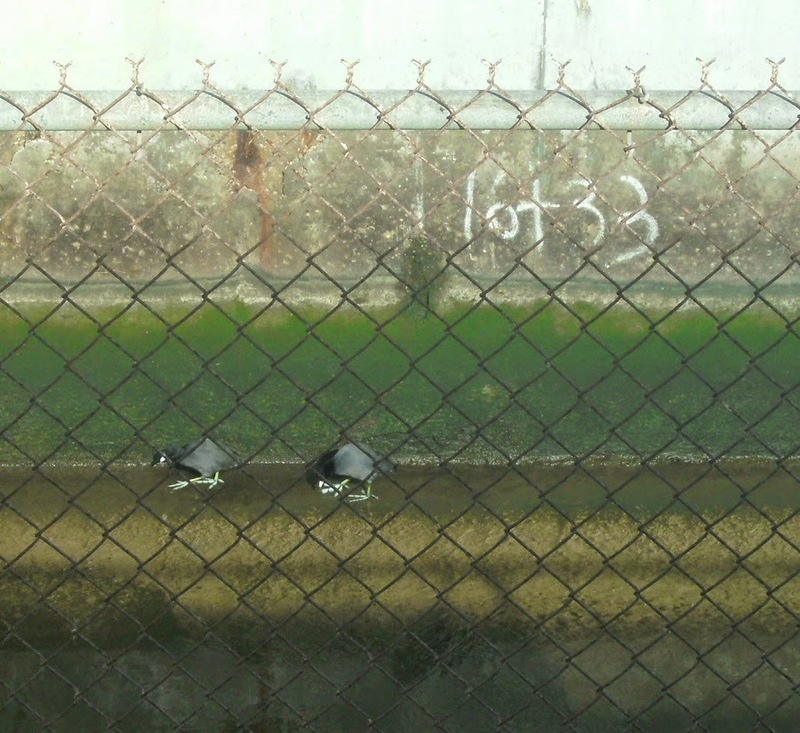 The other guys—maybe Pacific Coast Slime Eaters?—were nibbling green slime off the wall. 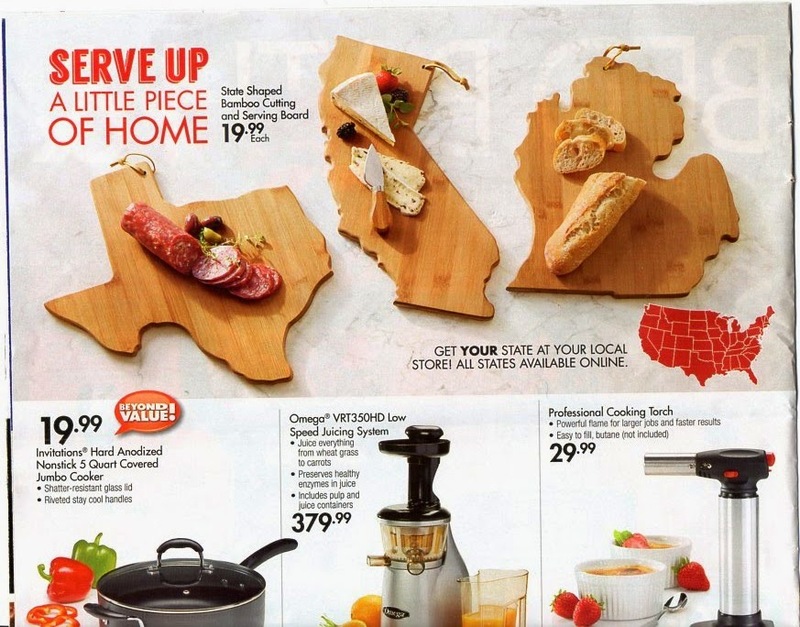 Anyway, meanwhile, Bed Bath & Beyond found the Upper Peninsula and made a cutting board out of it. Bless them. Seriously, why would I stop doing this? There’s a trolley that runs through town and it’s free and it stops nearby, well, maybe almost a mile once I think about it, but, it seems nearby (is closer as the crows and gulls fly) and I hear the driver clanging the bell sometimes when I am in the kitchen or bathroom or bedroom, clang clang, and I’ve wanted to ride the trolley—take it from here to downtown or from here out to the ocean and the ice cream place out there by the ocean—ever since I found out about it, which was pretty soon after I got here, so maybe two or so months ago. Dogs are welcome on the trolley, so I thought wow, Josie and I will do that, one day real soon, we’ll check out that trolley. But we never did. Until today. I took the trolley downtown. Josie stayed home. There was this big street fair downtown (and late this afternoon something called a “wine walk” and then this evening they make it snow, somehow, and it’s all very exciting, I hear, but I don’t know what that’s all about, anyway, I decided to skip the wine and snow), and dogs were welcome at the street fair (I estimate small dogs in attendance outnumbered large dogs something like sixty-three to one with medium-sized dogs numbering about five), but I left Josie home because I thought I’d go in some resale shops—Ventura is the Crown Jewel City of Thrift Stores—to see if I couldn’t find a white sheet or cloth of some sort for three or four dollars that I would then put under the tree I plan to get—my first Christmas tree in years—because I want a tree for the scent. The pine scent. You see, I walked out of a grocery store one day recently and right there were some Christmas trees for sale and the scent—the scent of the woods and the pine and the tar and the north and I could even imagine snow falling and just someplace else altogether—well, it stopped me cold. I stood there breathing deep. So thankful. And another day at a stoplight we were next to a truck pulling a flatbed trailer full of wire-bound fir trees stacked on their sides one on top of the other and Josie started growling and barking. The trees were on his side of the road and the window was down as it always is when we are at a stoplight and he wants to sniff and see where we are. Where we’re going. Josie growled and barked at this load of Christmas trees. I have plenty of room for a tree and I’ll get a string of lights and make some ornaments and the scent will be pine, beeswax, and, maybe, even, I hope, eucalyptus. And cinnamon. And we’ll play some Christmas songs and it will be Josie and Elliott’s first Christmas and first Christmas tree and hallelujah. Maybe I’ll order those rib tips from Hecky’s, have them shipped. I found a white sheet for $2.95. And there goes the trolley, clang clang. Labels: CALIFORNIA, culture shock, DIARY, dogs, Hecky's Barbecue, josie, where is the u.p. ?